LANAP is a painless non-surgical method for treating gum disease/periodontal diseases using a special form of DIODE DENTAL LASER.Before LASER gum diseases are treated by a gum surgery procedure called as FLAP SURGERY.This surgical method has got drawbacks like...it needs a surgical procedrue with sutures.And there will be bleeding during the surgery with post surgical tooth sensititvity issues and gum recesssion. The LANAP( Laser gum treatment) procedure avoids gum surgery/flap surgery .It nonsurgically strengthens the gums and treats gingivitis and periodontitis. 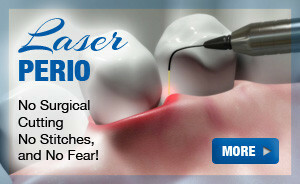 It is the best method for those who fear painful surgery and those who suffer from significant dental health issues. LANAP is used to remove the infection from beneath the gum line. The LANAP procedure is considered as a regenerative procedure as it regenerates the bone. It destroys bacteria and infected gum tissue. The LANAP laser can recognize pigmentation. The procedure is also helpful to prevent the chance of infection re-occurrence. The procedure is done in different steps. The first step is to prepare the patient. During this time, the dentist will take x-rays or examine the area of infection in order to find out the pockets and extent of infection. The procedure is done under topical anesthesia or with minimal local anesthesia. It is a non-invasive procedure which does not require other forms of sedations. The LANAP laser tip will be inserted between the teeth and gums. This is to remove the bacteria and infected tissue. Once the infected area gets cleaned, the gums are sealed with the laser heat to form a blood clot. This is done to prevent the bacteria from re-entering and re-infecting the area. The procedure will take around 2 hours to complete. LANAP may require more 2 to 3 sessions .The first session will take 2 and half hours..and further sessions will take 1 hour each. patient can continue his/her regular routine.No need to take off from office work. Health feel of teeth and gums..free of bad bacteria!